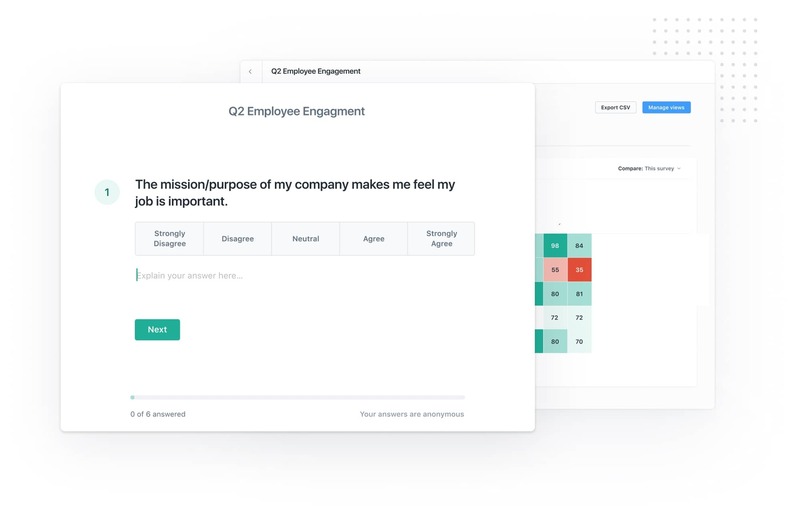 We’re thrilled to announce our latest product: Engagement, which gives People teams insight into employees’ level of connection to the company. Engaged workers are critical to business success — they’re more productive, the work they do is better, and they’re more likely to stay at their jobs for the long haul. Employee engagement is not a mystery; inputs ranging from management style to psychological safety make a huge difference. With Lattice Performance, we’ve been able to help companies build performance management practices (improve the inputs), but we haven’t been able to quantify the cultural impact and health of an organization (measure the outputs). That’s why we set out to build Engagement. While we're not the first company to build software to measure engagement, but we are the first to combine employee engagement surveys with a continuous performance management system. 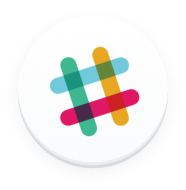 Instead of two siloed systems, Lattice customers now have one place for all things related to people management. We know from our own experience that how we perform and how we feel are deeply connected. This powerful combination will help leadership understand, for example, whether high performers feel that they are getting recognized enough for their hard work, or why low performers may feel left behind and struggling. By combining engagement surveys with our existing performance management solution, we’re also giving people teams the tools they need to take action on the insights they uncover with engagement survey data. Did you learn that employees don’t see how their work fits into the bigger picture? Lattice Goals can help provide clarity. Or do you have employees who feel like they aren’t getting enough time with their managers? 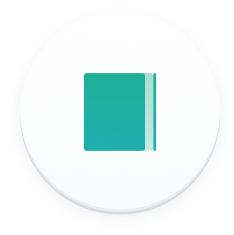 Lattice 1:1s makes it easy to start new management habits. We don’t just figure out the problem, we also provide the solution. So how does Lattice Engagement work? People operations teams build a survey that consists of a series of questions around preset and/or customizable themes like how valued employees feel, their faith in leadership, how connected employees feel to their company’s mission, and whether or not employees feel burnt out. Our preset question themes have the weight of considerable research and expertise behind them. In building this product, we knew that in order to give companies valuable insights about their culture we needed to be thoughtful about survey design — the way you set up a survey has a big impact on what you learn. So we partnered with a professor at UC Berkeley and behavioral economist, Elizabeth Linos, to design our question templates. Her research focus is on recruitment, retention, motivation, and performance in the workplace, and she’s a survey design and program evaluation specialist who’s worked with the big 4 tech companies. After the survey is completed, you can explore the data by department, manager, tenure, gender, performance, and more, using our analytics dashboards. 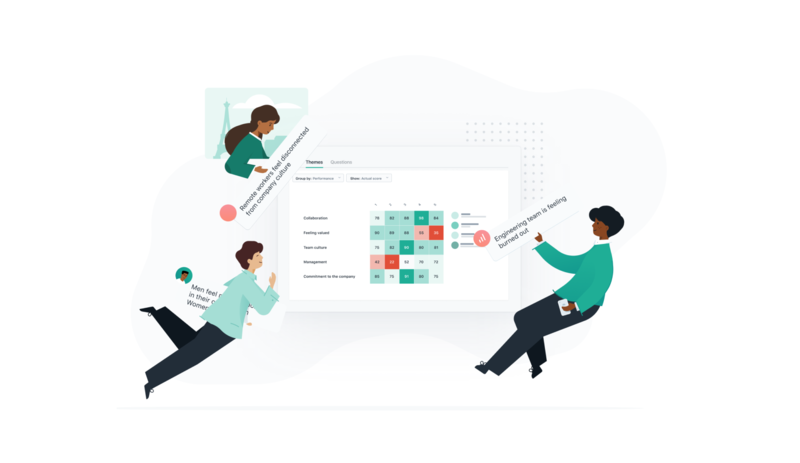 The dashboards are designed to give people operations and company leadership teams a holistic sense of employee engagement and the levers that lead to a happier and more productive workforce. We also store company benchmarks, so you can track this information over time. In the nearly two years since launching our performance management product, we’ve grown to over 750 customers. We’ve run nearly 10,000 performance reviews cycles, captured 60,000 pieces of ad-hoc feedback, facilitated over 150,000 1:1 meetings, and tracked over 130,000 goals. Supporting our customers as they build and evolve their performance management practices has been gratifying and enlightening. And today we’re building on this foundation by adding insight into a critical dimension of people management. It’s been exciting to see how customers that participated in our beta test used the insights they got from the engagement product to make smart people decisions to improve company-wide performance. And this is just the beginning — we look forward to building more tools that power today’s best places to work. 1) Schedule a demo with one of our product specialists to see the product in action. 2) Watch our webinar to learn more about how to approach employee engagement and performance management. This webinar is not a product demo, but rather a framework for how to think about performance & engagement at your company.